We had a beautiful sunny day for our December meeting at the Sedgwick County park. Attendance was great and a good time was had by all. One of the very good finds was under a penny signal. Dig all penny signals. If you are working an area relatively clean of trash, dig all mid-tones, including the low-end foil signals. We are ruminating on ideas for the next year. Stay tuned. This entry was posted in Group Meeting on December 5, 2016 by pulltabMiner. We had our first club meet yesterday since the departure of our beloved founder and leader, Steve. Alas! he will be missed. It was a good turnout and the weather was near perfect. At one point we were visited by a cookie-sniffing winnie dog but the cookies were chocolate chip so he couldn’t have any. We conducted the club’s business which included ideas about leadership models. People seemed to like the concept of 3 month leadership teams. More on that later. Also, we spoke briefly about the possibility to hold classes only for club members, aiming at spreading the knowledge from the more experienced hunters to the rest of us newbs. Information will go out to the members as these plus other ideas take hold. Have patience with us as we sort things out. For starters, I will try to keep this page updated. Steve if you read this, it may be nice for you to write a thing or two about your experiences in the frozen north. Again, thank you all for your patience and happy hunting! This entry was posted in Uncategorized on October 3, 2016 by pulltabMiner. Here are some more details. Hope to see everyone there! Feel free to email us with questions. This entry was posted in Uncategorized on February 19, 2016 by steveouke. Good afternoon, I wanted to take a moment and let you know about an exciting upcoming event. 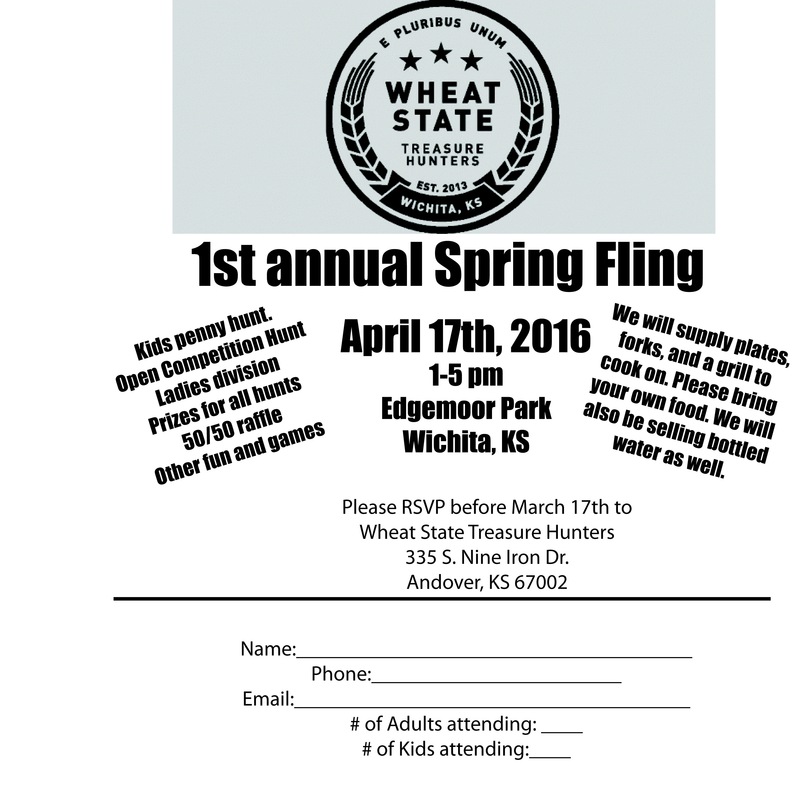 Mark your calendars for April 17th 2016 for our first ever “Family Spring Fling”. This will be a fun event for the whole family. We will have kids hunts, ladies hunts, food, and prizes. Stay tuned as more details come available. It should be a good time! This entry was posted in Uncategorized on September 23, 2015 by steveouke. Good evening, I just wanted to let everyone know that we will be meeting at North Linwood park on Sunday the 13th from 3-6 PM. The weather should be great and we will have some interesting things to discuss. I know there have been some great interesting finds around town lately and I hope everyone will bring some goodies to the table. Also I wanted to let everyone know that I have created a short survey since it’s been a couple of years and I’m certain there are some opinions out there. Please take a few moments to answer the questions by clicking the link below. This entry was posted in Uncategorized on September 9, 2015 by steveouke. Good evening everyone. Sorry for the late delay about this weekends meeting. My bride and I have been traveling and staying busy. Vince mentioned that this is our two year anniversary and I wish we were able to plan a big happening but I haven’t had the time. Now my suggestion is that everyone brings a guest and a dish to our June meeting on Sunday. I think we should head out west to Sedgwick County Park and try to secure us a pavilion. I’m thinking our best chances will be in the northeast corner of the park. Hope to see you there at 3:00 on Sunday the 6th. We have been invited to work with the fine folks at Cabelas to bring some metal detecting information to their customers. They are asking if we would like to present a seminar similar to our class 6 times throughout the weekend of June 13th and 14th. In return they are giving us a $100 Cabelas gift card. We will discuss volunteering opportunities on Sunday. I think it is important for us to accept this proposal and I am hoping to get a few people that can help at least in short shifts next weekend. July 11- We are scheduled to do a class on July 11th with the City. I hope things with them have settled down and we can get back into the swing of doing classes. However I think we need to discuss what we would like in return so if you have ideas we can discuss them as well. Thanks and I have to apologize for the late details about the meeting. However we don’t want to get tooooo organized! This entry was posted in Uncategorized on June 5, 2015 by steveouke. Good morning all, I wanted to take a moment and let everyone know that today’s class has been cancelled. We will reschedule soon. This entry was posted in Uncategorized on February 28, 2015 by steveouke. If you want to automatically receive updates you can go to http://eepurl.com/SUYhn and input your email address. This will ensure that you receive emails about upcoming events, club news, and hunt information.